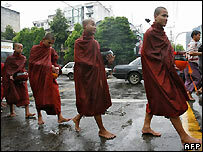 Monks have been protesting in Burma, adding to the rare public defiance seen in recent weeks. The BBC's Andrew Harding has just returned from the country and explains why the monks' involvement will make the military government nervous. In a crowded monastery dormitory on the outskirts of Rangoon, a 17-year-old monk flexed his arm muscles in a somewhat incongruous show of strength. "I'm ready to fight," he said with a grin. "We all are." It was 1100 local time, and the young monk and his friends had just returned from their regular morning tour of the neighbourhood, collecting donations of food in their black alms bowls. A sudden rainstorm had drenched many of them on their rounds, and a row of soaking brown, orange and maroon robes were hanging out to dry on a broad wooden balcony. "We are organising," whispered another young monk, between mouthfuls of rice, as he sat on a mat in the dark dining room. "We are planning more protests. People are angry about what has happened to our country, and about the way these thugs attacked us." On the wet street outside, a quiet crowd had gathered to wait for leftovers from the monastery. Before long, ragged children and barefooted men were jostling for scraps. In a country with alarmingly high childhood malnutrition rates - where a growing number of families are reduced to one meal a day - the monks are acutely aware of the suffering around them. It is that suffering, along with resentment about the beating of individual monks by the authorities in earlier protests, which appears to have triggered this week's sustained campaign of street demonstrations. Monks in Rangoon and across the country have marched in a direct and humiliating challenge to Burma's military authorities. The monks' involvement has breathed new life into a campaign which began last month as a response to an abrupt fuel price rise, and which had been faltering following the arrest of more than 100 activists. What no-one knows yet is how much of a threat the monks now pose to a military government which has held power in Burma since 1962. Could this be the start of what a United Nations official here, speaking on condition of anonymity, described as "a perfect storm" or will it simply fizzle out in the months ahead? "The monks have the potential to add an exponential factor," said the UN official. "We are looking at the emergence of trends that could make this impossible for [the generals] to handle. It's got the makings of a major disaster." "It is an unstable time," agreed the veteran democracy activist U Win Naing. "Unless the government is willing to compromise... then there could be chaos. So far the government has done nothing to ease the situation. All they do is try to oppress protests... rather than come up with solutions to solve problems for the poor." Much now depends on how the military handles these protests - how much tact the generals can muster. "Are we seeing just a blip," asked the UN official, "or will this force the authorities to define a hardline stance?" The authorities have shown no qualms about beating and arresting opposition activists in recent weeks. But Burma's monks occupy a revered place in a profoundly devout society, and so, while some of their protests have been answered with tear gas and arrests, the authorities have generally allowed the monks to march without major interference - merely watched and filmed by plain-clothed police. A glance at the front pages of the government-run newspaper, "The New Light of Myanmar", gives an indication of how sensitive the authorities are becoming to this issue. "Lt Gen Myint Swe and party presented offerings including robes..." runs the main article, above another column claiming that "protests are no longer fashionable". 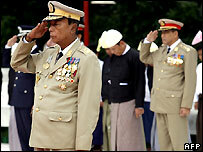 An accompanying photograph shows the general on his knees in front of a senior monk, in a public display of reverence. For years the military has assiduously cultivated ties with the senior clergy, often spending huge sums on building or renovating temples. Those ties may yet pay off. The government is also helped by the memory of the bloodshed which ended the last significant protests in 1988, when some 3,000 people were killed when the authorities launched a crackdown. At another monastery in Rangoon, I asked an older, bespectacled monk if he believed the talk from his younger colleagues about a long "fight". He shook his head. "Here in Burma," he said, "we are born afraid."